It would have been harder to find a more unlikely person to chronicle and popularize the skinhead sub-culture of the late 60's and early 70's in the U.K. then James Moffatt. 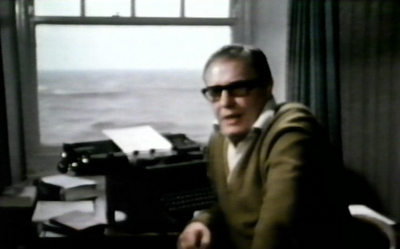 Using the pseudonym Richard Allen, this middle-aged, Canadian hack writer was hired by the New English Library publishing house in 1970 to write a pulp fiction 'exploitation' book about the skinhead movement which was then a social phenomena all across Britain. 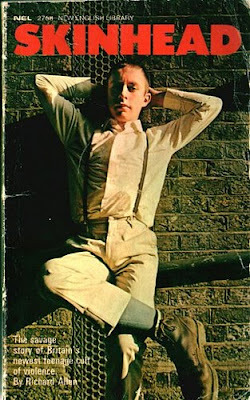 Spending just three days in and around East London to interview a few skinheads, he used their true life stories as the basis of his first novel 'Skinhead' which was written in just five days time. Despite the formulaic quality of the book, it went on to sell over one million copies. Before Allen, most youth novels were written from an adult viewpoint and the heroes always mended their ways - usually under the influence of a benevolent or socially concerned teacher. Allen's heroes never mended their ways. As such, it's quite possible that 'Skinhead' was more widely read among British teenagers than any other novel of the day. "leniency in courtrooms, catering to fads by mercenary-minded rag-trade merchants, a soft-peddling attitude by politicians who look for teenage votes to save their seats, and an overwhelming pandering by the news media"
Not surprisingly, Allen never explored or included the true roots of skinhead culture in his books, which was decidedly multi-racial and based on a love of Jamaican music, culture and style. Indeed, one of the most prominent skinheads in the U.K in the 1970's was Laurel Aitken. As a counterpoint to Allen's skinhead stories, watch the short video below where Aitken and Doug Trendle (AKA Buster Bloodvessel of Bad Manners) describe the harmony between black and white skinheads who socialized together and were drawn together by their love of ska and reggae. Fantastic interviews/footage of Laurel and Buster (before he had the gastric surgery...boy he was heavy). Never picked up the Richard Allen books...but didn't know that they were on the racist/fascist side of things...(but it figures he was writing from ignorance of the scene and just plain ignorance itself).